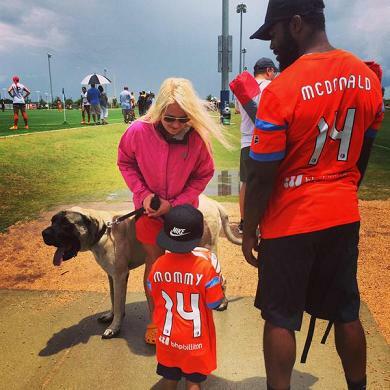 Over time it has become standard practice for the goals to flow almost as freely as the dance moves for Jess McDonald, giving the Houston Dash forward an enhanced reputation in recent years which have also seen her become a wife and mother, resulting in a new outlook on and off the field. With FC Kansas City having wrapped up the 2015 season with a second successive Championship, the first three years of the National Women’s Soccer League (NWSL) have given much to reflect on. Numerous players have risen to the fore and served up sparkling entertainment since play began back in April 2013 and one of those to have enjoyed tangible progression is forward Jess McDonald. A two-time NCAA National Champion at the University of North Carolina, the Arizonan’s career began in earnest in America’s second attempt at a pro women’s league – Women’s Professional Soccer (WPS). On her very first WPS start, for Chicago Red Stars against Washington Freedom in August 2010, she suffered a torn patellar tendon, ending her season. That was to be the last time she would play in WPS, as the league folded after one more year, while Jess had seen her primary focus switched to becoming a mother. As has often been referred to, sustaining a career as a professional women’s soccer player has long been an arduous task for so many, with meagre financial reward and significant sacrifices required. Yet to truly stamp her mark on the game at the time, despite the promise she had shown in college, Jess was given the chance to reignite her career in 2012 with Melbourne Victory in Australia’s W-League. At 24, her form took off Down Under, and after briefly representing Chicago once more when pro play returned in the U.S. with the NWSL in 2013, she demonstrated her scoring touch with Seattle Reign that season. In the last two seasons, she has led the scoring charts for both Portland Thorns and the Houston Dash and can surely consider herself a player with a legitimate case for a first call-up to the U.S. Women’s National Team in the near future. Undoubtedly one of the NWSL’s most feared attacking performers, as well as a married mother of a three-year-old son (Jeremiah), Jess has more reason for perspective than most and she has relinquished a degree of anxiousness since those days of WPS. “This soccer journey of mine has taught me patience. I would tell Jess from five years ago to be patient, whether it’s on or off the field. Soccer can certainly bring its pressures but the moments of liberation and release are almost indescribable. Amid the battle for on-field success, players can show it in varying ways when they are genuinely enjoying themselves and Jess’ group at UNC were one team who proved that can begin way in advance of the whistle for kick-off. Numerous one-time Tar Heels have uncovered their life’s relationship with music on here, including goalkeeper Ashlyn Harris, defender Meghan Klingenberg, and midfielders Allie Long, Heather O’Reilly and Yael Averbuch. Another of those was Amber Brooks, and the current Seattle Reign midfielder told about how Casey Nogueira and Nikki Washington carried portable speakers wherever the team went. Jess, who netted the only goal against Stanford to clinch the 2009 National Championship, was a definite part of the pre and post-game dance parties as a Tar Heel, and whether it’s to hype her up or relax her mind, a beat or melody are never far from her to this day. “Music plays a huge role in my life. I wake up and the first thing I put on is Drake. Before her efforts turned to focus solely on soccer, Jess was a state champion in basketball with Cactus High School in Glendale in 2004 and 2006, as well as breaking the state record for the 400m and the school records for the 100, 200, 400 and 4x400m relay. On the field, she represented the reputable Sereno Soccer Club from 2000 to 2007, winning the state championship in each year she played and notching the regional championship in 2003 and 2007. Jess’ older brother is the former LA Galaxy, San Jose Earthquakes and D.C. United defender Brandon McDonald and the Guam international was a big inspiration when she was growing up back home in Arizona. The musical side of those days, meanwhile, had more than a little LA influence for her. “(I listened to) anyone and anything West Coast. I believe I listened to more Ice Cube than any other artist. After high school, Jess ran track and played basketball and soccer at Phoenix College as a freshman, before competing in the former two as a sophomore to retain three years of soccer eligibility at UNC, where she would transfer to. In her first season at Chapel Hill she scored five and recorded a team-best ten assists as the Tar Heels went on to defeat Notre Dame 2-1 for the 2008 National Championship, with Jess winning the free-kick for the first of Casey Nogueira’s two goals. The characteristic high-pressure approach of UNC under Anson Dorrance was in evidence as they secured their second consecutive crown a year later, putting aside an unbeaten Stanford team in front of over 8,500 at Texas A&M’s Aggie Stadium. 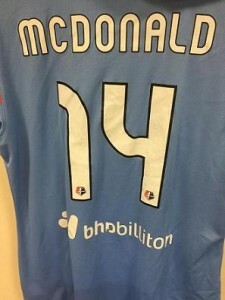 With the number 47 on her back, Jess scored nine and provided six assists as a senior that year and she came up with the game’s only goal as the Tar Heels ousted a Stanford side containing 2015 World Cup winners in Christen Press and Kelley O’Hara (while UNC had Ashlyn Harris, Tobin Heath, Meghan Klingenberg and Whitney Engen from that victorious U.S. squad). It would be almost impossible for Jess to cast her thoughts back over her years in Carolina blue without recalling the dancing. However, it was a Californian former defender from her WPS career – someone who went on to found the GreenLaces organisation – who takes the medal for most memorable mover she has ever shared a locker room with. The 15th overall pick in the 2010 WPS Draft, Jess saw her progress in her first stint with Chicago cruelly halted by serious injury after playing only five games, but the Red Stars were to be the first team of what has turned out to be a terrific NWSL career to date. There was a moment of melodic unity she got to enjoy as a Red Star, as she acquired a group of backing singers, just when she needed them the most! Since she became a mother, Jess has gone on to reach new levels of form on the field and that began with firing seven goals for Melbourne Victory in the 2012/13 W-League campaign. Although they were ultimately defeated in the Grand Final by Sydney FC, it was a highly significant phase in Jess’ soccer story and the first time she worked with Australia defender Steph Catley, who outlined in her interview on here the off-field impact Jess had on her during their time at Portland last year. The women’s game has fascinating personalities dotted all around its many teams, leagues and nations, with a select few of those possessing serious singing talent. One of Australia’s numerous young playing prospects has demonstrated what she can do in this regard and Jess remembers her glimpse of the 20-year-old’s instrumental and vocal ability, identifying her as the standout singer she has played with. 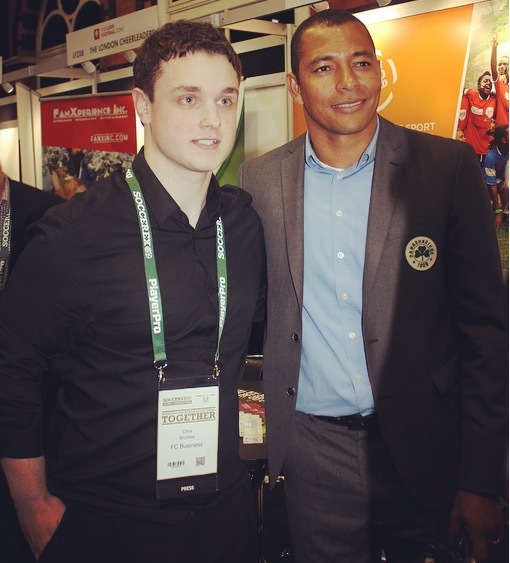 “I would definitely say my old teammate and goalkeeper Bri Davey. I played in Australia with her for Melbourne Victory. On her Seattle Reign debut in 2013, Jess took a pass from Christine Nairn to score past the Boston Breakers and it was against the same opponents that she would come up with one of her most impressive efforts to date. That goal was for Portland in their televised 6-3 win over the Breakers in July 2014 as she showed terrific skill to beat Bianca Sierra and fire in a finish beyond closing defender Rachel Wood and goalkeeper Alyssa Naeher from a tight angle. The 11 goals (with one assist) Jess racked up in Portland colours in 2014 put her level with Washington Spirit’s Jodie Taylor, with only FC Kansas City’s Amy Rodriguez (13) and Seattle’s Kim Little (16) netting more in the league. She managed that tally despite only starting 13 of her 24 appearances for a Thorns side filled with notable attacking names like Christine Sinclair and Alex Morgan, as well as Allie Long and Vero Boquete supplementing from midfield. Nevertheless, her ‘exceptional attitude and professionalism’ had certainly impressed Thorns coach Paul Riley and she headed to Frauen-Bundesliga side Herforder SV in the close-season off the back of a breakout NWSL year. It was while she was in Germany that she discovered she had been traded to Houston in a set of moves which also saw Portland acquire Jodie Taylor from Washington. Jess was certainly in the groove for the Dash last season and when asked which career teammates she would record a song cover with, with the exception of Thorns defender Kat Williamson, her ensemble entirely comprised members of the 2015 Houston roster. 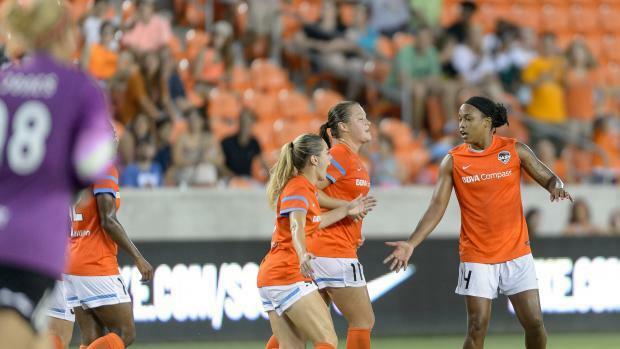 Named in the 2014 NWSL Best XI second team, Jess continued her form down in Houston, scoring seven and providing an assist to finish as leading scorer for the team. Fans also got a chance to see her express herself in another way, as she showed off her dance moves alongside teammates Erin McLeod, Ella Masar and Brittany Bock on The Ella and Erin Show on YouTube. She came up with a double in the 3-2 defeat to Boston in April and celebrated with another rhythm showcase, this time on the sideline. Jess opens the door to the Dash locker room as she describes the energy and the DJs on game day. “Sometimes I will get up and dance. It has to be a good upbeat song for me to get up and dance; if it’s a song I’m not feeling in the locker room, I’m in my seat silent for the most part. “Some games, our trainer, Kristy (Chavez), would play Pandora, which played pretty much every genre. Toni Pressley would step in sometimes and throw in some of her tunes; she would play mostly hip-hop and r&b. In May, Jess was back at Providence Park to haunt her former team with the winner as Houston secured their very first victory against Portland. 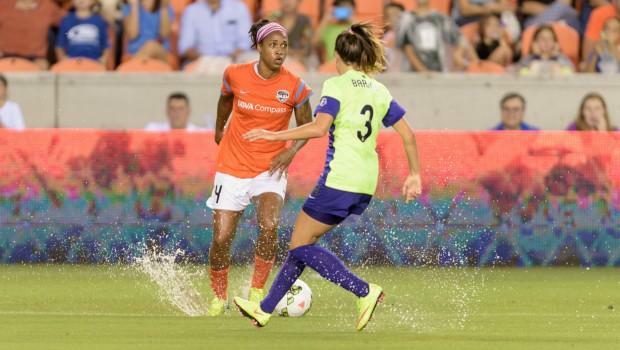 Along with recently-retired forward Melissa Henderson, Jess was the only Dash player to appear in all 20 of their games (starting 19), and her head coach, Randy Waldrum, has been impressed with her efforts ever since she arrived. “Jess has been fantastic to work with so far; she is a true pro and works so hard at training. She is also a wife and a mother, so she is able to bring some of that maturity to our team, which is a young team overall. “She has so many things that she juggles in her daily life that our players cannot help but be inspired by her ability to focus on her training as she does. She is grasping my idea of how I want her to play and is also very open to new thoughts and ways of doing things. Leading the women’s soccer program at Notre Dame from 1999 up until his appointment as the very first Dash head coach in 2014, Waldrum won the 2004 and 2010 National Championships with the Fighting Irish. Defeated at the last hurdle by Jess’ UNC team in 2008, the Texan certainly hasn’t forgotten the college version of his current player and he offers further insight into why he has endeavoured for so long to have her on his team. “I actually tried to recruit Jess out of high school for Notre Dame; of course she ended up the enemy at UNC! Seriously though, she was a handful in college. “What caught my eye was her speed and strength and ability to run past players with such ease. Then around the goal she was always efficient, and every program needs that. “I think she destroyed us at Notre Dame on a couple of occasions! I wanted Jess with us at the Dash as I need someone that can simply score goals, and Jess has proven the ability to do this in the NWSL. “She had a great year for Portland the previous year, and in reality, I believe they made a mistake in not keeping her in the lineup when Sinclair and Morgan came back from injury. National Team midfielders Carli Lloyd and Morgan Brian caught the eye as new additions for the Dash last season but they were among those who had to be away from domestic action while they participated in the World Cup. Along with Kealia Ohai, Lloyd weighed in with four goals, though she was limited to 12 appearances over the season, meaning that the scoring mantle lay ever more with Jess. The Dash rose from their inaugural-season finish of 9th to a placing of 5th in 2015, and only six points shy of the playoff places. The battle to win games is important for any team but there is also a bigger picture and Coach Waldrum is in no doubt that Jess embodies exactly what a coach looks for, as well as the qualities to represent women’s soccer beyond the field. “I think as far as soccer is concerned, Jess simply has that blend of great athleticism, size, strength and power that we all look for. Most players have one or two of these qualities, but not the whole package. “Really though what has amazed me about Jess is simply the person she is. She is great with our young players, she is a true pro in the way she trains and takes care of her body, and she is a fantastic mother and wife. “I am just blown away simply by how good of a person she really is. Her faith is important to her, she has her morals and character in place, and is just a very good person, loyal to a tee. While she was a Thorns player, Jess’ husband, Courtney, was working in Arizona and the idea was for them to live together in Portland. He enrolled to train as a firefighter, but as can so often be the case in professional sport, their plans were altered as Jess learned she was moving on. As much as you accept that as a pro athlete, it doesn’t necessarily make it any easier when you and your family have to make huge adjustments to your location and life. It would be inaccurate to suggest Jess and her husband and young son found it plain sailing making the switch to Houston but they were grateful for the assistance given to them by the Dash in that regard. Jess paints the picture of how the family spend much of their time in Houston, with three-year-old Jeremiah understandably the primary focus. “My family and I have adjusted really well here by reaching out to other families with kids that are around our son’s age. We enjoy doing things with our son; at this age, they have a lot of energy. “We take him swimming, to the park and/or on a bike ride every day, when it’s not raining. We try to be outdoors mostly, even with this humidity. A major in African-American studies at UNC, Jess was capped at youth and Under-23 level with the National Team and wants to be able to tell her son she went for it in pursuit of making the full team. Even to look back on the last two or three years would be to reflect on a huge amount of progression, but to rewind all the way to WPS shows just how far she has come, as a player and person. When she suffered a torn patellar tendon against Washington Freedom on her first WPS start, her Chicago teammate Formiga also exited the game through injury. The Brazilian’s replacement was someone who gave Jess support she has always remembered. Washington, Portland, Kansas City, Western New York, Sky Blue and Boston all felt the force of Jess’ scoring talent this year and it is time to give her the opportunity of choosing a team of her own. She has coached youngsters on plenty of occasions and is of course a mother, so maybe she could handle keeping these players in line! This is the regular final question on here and each interviewee is asked to imagine playing in a 5-a-side team. They have to nominate four others they have played alongside in their career to complete their team and the reasons why can be entirely their choice. The likes of Tobin Heath, Meghan Klingenberg and the aforementioned Formiga were mentioned as Jess began to come up with a selection, so who made the starting team for this admittedly tough question? Introduce those names, Jess! “Keeper: Erin McLeod – her leadership capabilities are impressive. She’s very vocal and quick off of her line. “Defender: Steph Catley – she’s left-footed, hard-working, she can defend and do well on the attack as well. She is also a great finisher. “Midfielder: Vero Boquete – she works her tail off on both ends of the field. The ball is glued to her feet and she’s one of the few female soccer players I know that is very comfortable with the ball.